When it comes to investing in a loft conversion, make sure that you remember to think about the finer details. The windows are one of the main features of your loft conversion and with the frames, opening mechanism and the glazing all being separate components, you now have the opportunity to purchase a window that meets your specifications when you choose the Duratech range. Whether you’re looking for natural wood, uPVC or a painted effect, we stock a huge range of frames that are sure to add style to any loft conversion. If you like to have the windows wide open in the summer or you’re conscious about a safety catch for the children, you can be sure that we have the pivot mechanism for you. No matter which pivot and frame you choose, you can be sure that Duratech only uses the highest quality glazing for their window panes. Using the latest in insulation technology, a Duratech window will make sure that your property remains warm in the winter and cool in the summer. 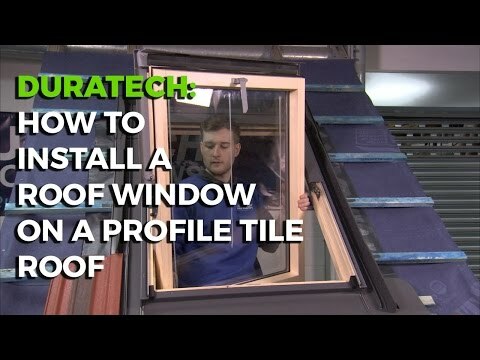 If you are searching for a high-quality window that is purposely designed to make a room appear as bright as possible, look no further than the Duratech AAX White Painted Centre Pivot Roof Window. Manufactured to fit roof pitches from 15 to 90 degrees, these stylish windows will make a fantastic addition to any property. Carved from kiln-dried Nordic Pine, the slim wooden frames allow for 10% more light to filter through than other man-made alternatives. The FSC-certified wood is treated with a fungicide and varnished with a clear water-based acrylic lacquer to ensure that it retains its strength and condition. It is then coated in a specialist white paint which reflects light and helps create the illusion of a brighter room. The windows are showcased by their innovative centre pivot mechanism which allows the user to have large level of control over how wide it opens. This design feature is assisted by the stylish moulded zinc handle which allows passive ventilation via two locking positions. Taking the finer details into account, all facing aspects of the wood are knot-free which means that you experience continuity across every installation in your property. The manufacturer has also carefully considered the external appearance of the Duratech AAX, refining the design so it sits lower into the roofline. Possessing the latest insulating technologies, the 24mm thick glazing is argon-filled and consists of two 4mm panes of coat glass either side of a 16mm gap filled with argon gas. This gives the windows a highly efficient energy rating U-value of 1.4 W / m²K. In addition to ensuring that your property remains warm in the winter and cool in the summer, the technology reduces noise transference which is great if you live somewhere where noise pollution is a problem. The manufacturer has also added the safety bonus of low e-coating and an external pane made from toughened glass. Strengthened using a tempering process, this glass is more resistant to impact and shatters into dulled-edged cubes rather than sharp shards which greatly reduces the risk of injury. The Duratech AAX White Painted Centre Pivot Roof window is manufactured in an ISO 9001, ISO 14001 and OHSAS 18001 certified facility. All products are created using the very latest in technology in order to guarantee a high quality roof window. We sell the flashing as either a single or a combination purchase which means you can find a style that will perfectly blend in with the existing exterior of your property.